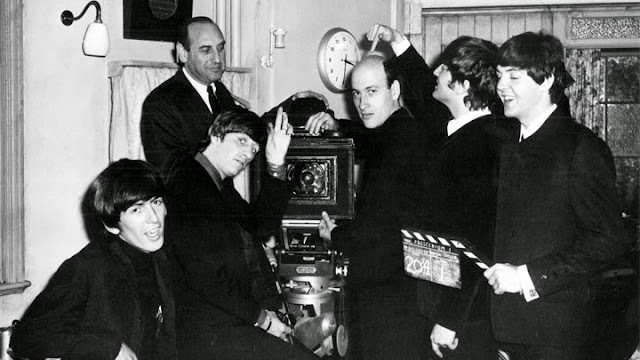 Note: Back in October 1985, director Richard Lester -- the bloke being poked by John Lennon in the above photo -- came to Houston for a retrospective of his films at the Rice University Media Center. I had the pleasure of interviewing him before he arrived in H-Town -- and the privilege of conducting a Q&A with him after the Media Center screening of A Hard Day's Night. We talked a lot about that seminal cinematic treat -- and its influence on a then-trendy phenomenon known as MTV. Starting July 4, several venues nationwide (including the Museum of Fine Arts, Houston and Nashville's Belcourt Theatre) will celebrate the 50th anniversary of A Hard Day's Night by screening a newly spiffed-up version of Lester's merry masterwork. So I thought it might be a good time to recycle my 1985 feature story about the man behind the merriment. If A Hard Day's Night didn't exist, someone at MTV might have tried to invent it by now. But it does exist, thank heaven, and it remains as vibrantly fresh as ever, more inventive and exhilarating than 99.9 percent of the music clips introduced by cable VJs. The larky musical-comedy showcasing The Beatles will be on view at the Rice Media Center as part of a two-week retrospective tribute to its director, Richard Lester. After the screening, Lester will be on hand to answer questions about his life, his films -- and his work with The Fab Four. Earlier this week, Lester laughed politely at the suggestion he created the world's first, and longest, music video when he directed A Hard Day's Night. ''Fortunately,'' he said, ''I didn't know I was doing that. I plead total innocence. But I must say, it was very kind of the MTV people: Apparently, I was their first inaugural Hall of Fame member. Almost overnight, Lester established himself as one of his generation's most innovative filmmakers, a wildly eclectic virtuoso who merged the gracefully zany farce of silent-movie comedy with state-of-the-art editing and cinematography techniques. Just as important, Lester -- who began his career as a director of live television programs, then worked his way into the quick-cut, hard-sell world of TV advertising -- somehow had devised the perfect visual style to accommodate the flashy, frantic ambiance of what was then being hyped as the era of Swinging England. In this case, Lester said, he was charged with making a film that would reflect the frenzy of Beatlemania, contrasted with the ironic calm of the four lads -- John Lennon, Paul McCartney, George Harrison and Ringo Starr -- who were generating all the excitement. To get a first-hand glimpse at the phenomenon, Lester accompanied the Beatles on a tour of Paris. He didn't see much in the way of glitz and glamour -- but he did notice The Beatles had to barricade themselves in hotel rooms to hide from zealous fans. It was also, in many scenes, improvised. Essentially plotless, A Hard Day's Night follows The Beatles as they hide from fans, travel by train, hide from fans, rehearse for a concert, hide from fans, perform in concert, and hide from fans some more. One of the film's best production numbers, ''Can't Buy Me Love,'' serves as a liberating break from the rigorous routine. ''All that page of the script said was, 'The boys escape by playing in the field.' So we ad-libbed on three different locations, each two hours long. The circumstances of some shots were dictated by the fact that Paul got drunk one night, and was very hung over -- and didn't show up for filming. So I put on a pair of his boots -- I happened to be wearing black trousers, anyway -- and hand-held the camera, and used my feet as the fourth member of the group. Otherwise, I think the brighter members of the audience might have noticed that 25 percent of the group was missing. Ironically, the ''Can't Buy Me Love'' sequence often is excerpted and shown nowadays as a music video -- much to Lester's chagrin. ''Until that point in the film, the boys were in very confined spaces, and being told to go here, do that. They were managed and organized, pushed into this and that, told they should rehearse, go into this hotel room. And, no, you can't get out of the car because the crowd's here. With A Hard Day's Night, Help! (another Beatle comedy, and in many ways a much better film) and The Knack, Lester almost single-handedly created in the mid-1960s a new cinematic syntax that was quickly and widely emulated -- most notably, by the producers of The Monkees -- but rarely used with the same kinetic imagination and giddy effervescence. He later polarized audiences and critics when he brought this same flamboyant visual flair to How I Won the War, a scathing anti-war satire, and The Bed-Sitting Room, an episodic black comedy about life after a nuclear holocaust. Lester matched style and content perfectly, even brilliantly, in Petulia, an unexpectedly moving romantic comedy about two rational adults seeking love in a totally irrational '60s San Francisco. And his romantic streak appeared even more pronounced in his glorious Robin and Marian. In recent years, Lester has toned down the visual pyrotechnics. But his better films -- The Three Musketeers, Juggernaut, The Ritz -- reveal him as a moviemaker blessed with impudent wit, an iconoclastic disdain for genre conventions, and a fondness for inspired offbeat casting. And, no, he's not interested in offers to direct music videos. The reason this films continues to delight and entertain is that Richard Lester wanted to make a great movie that happened to star the Beatles, that could stand on its own, and not just a film that would capitalize on their fame. As a result, the film is stuffed to the brim: with ideas, inventive camera shots, unusual and bizarre characters, and more jokes this side of AIRPLANE!